So it has been colder here in NY last couple of days and I have officially broken out my winter coat. I'm not quite sure how I feel about that. I love autumn, and cooler weather, but I'm no where near ready for snow. I am however ready to wrap myself up in huge blanket scarves. They are by far my favorite trend, one that I hope sticks around for a good long time. I mean, who doesn't want to wear a blanket to work? I have been waiting for this forever. And so I have been experimenting with different ways to style them. (You can see my previous attempts here and here.) This time, I decided to try belting it, which definitely helped keep things in place with the obscene amount of wind I encounter on my walks to and from work. I kept the rest of my outfit simple with jeans, a beige sweater, and brown ballet flats for an afternoon lunch date with JD. That's so cute! and very creative, I never would have thought of that. 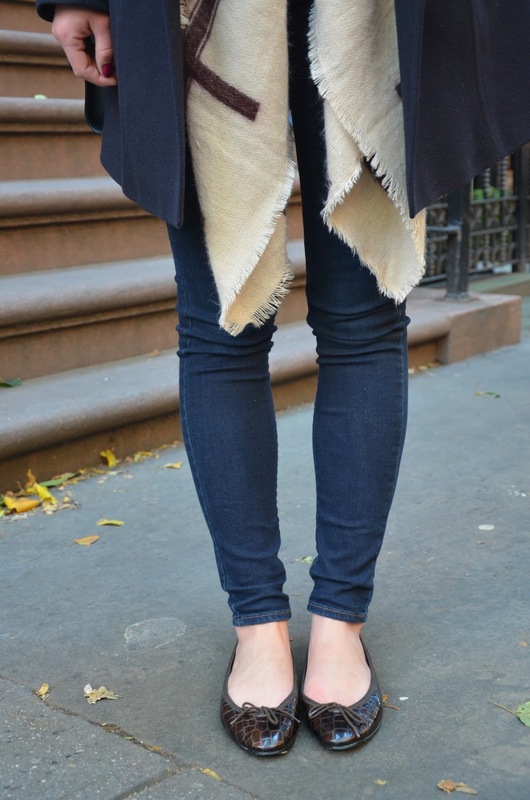 This is such a fun way to make the scarf part of your outfit!! We get a lot of wind here too and this is a genius idea!! Side note- beautiful scarf! Yes times a million to this look! 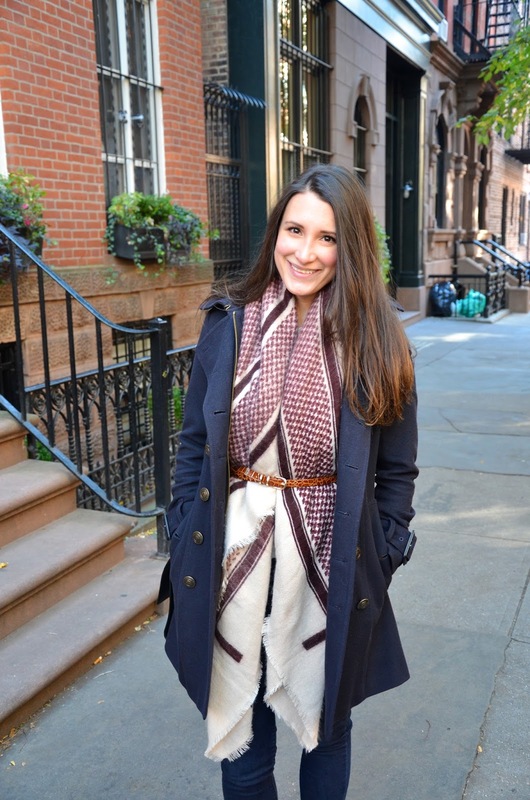 I love how you wrapped a belt around this beautiful blanket scarf (that I need to purchase immediately). 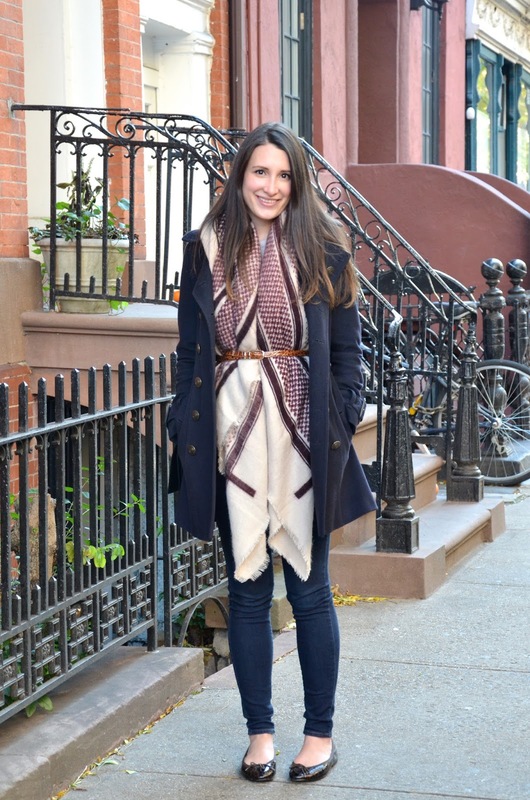 The blanket scarf looks perfect belted!! Love this scarf and that jacket! Oh, you rocked this. So cute, girl! Now I want to try! love this idea, i would not have thought to belt it like that! def will be trying soon since it is getting cold here too and supposed to be down to 30 next week wahhhhh. I love it belted like that! Oh noooo I'm coming sunday I hope it's not TOO cold. I wanted to enjoy some nice weather before snow! Don't worry, it's warm again today and is supposed to stay that way through the end of the week! Super cute look. I'm loving the new collection of dbl wide scarves Zara is carrying this season. They've actually got a boarder selection. Last year is was nothing but check/plaid. This year they have solids. I already purchased two scarves & one poncho. I'm going away in a few days and will use one of them on the plane. Today it's beautiful here in the city. You probably only need the scarf. This one looks great on you. The off-white & burgandy compliments your complexion and hair color. Great choice. I love this look and have been wanting to give it a try! Thanks for the inspiration. 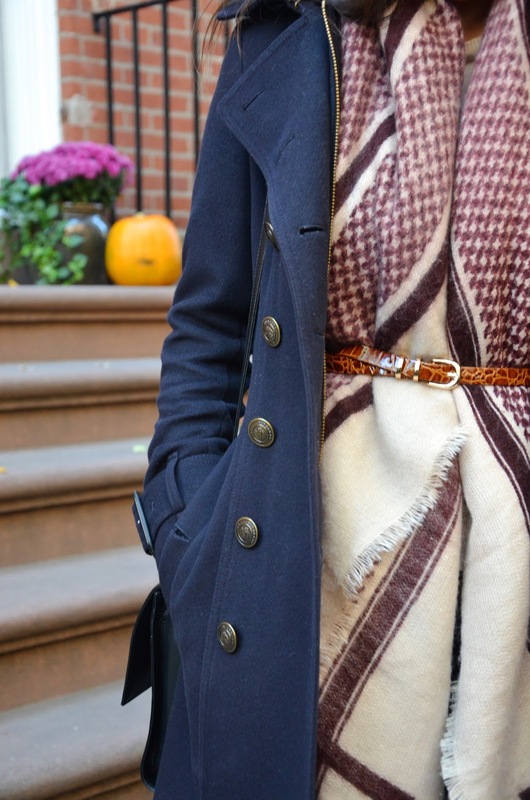 Love the way you belted your scarf! So fun and different! This is perfect. You are completely channelling and could be mistaken for Olivia Palermo.